Exhibited in different shows in the same location one year apart, Memorial to John Franklin part 1 & 2 (Buddleia/Shroud) are connected geographically and mnemonicly. 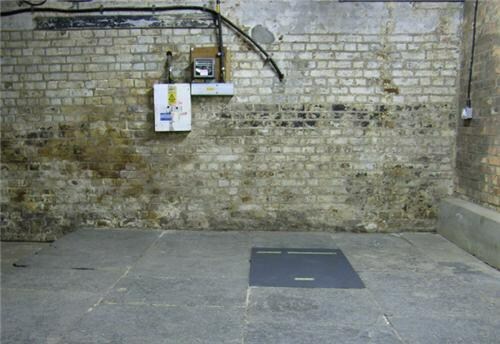 Memorial: Shroud rests on top of a flagstone, the exact same size as the stone, in a pre-Victorian warehouse in East India Dock near to the start of John Franklin's failed 1847 expedition to discover the Northwest Passage. Despite the largest man search ever staged the Victorian explorer remains still missing with his two ships the 'Erebus' and the 'Terror'. Victorian society was scandalised by rumours of cannibalism on the expedition following the discovery of remains beneath cairns.